12/22/2014.......We want to say THANK YOU to all who have donated to the horses in the last two weeks. The communities response has left us all speechless. We needed to raise 3000 dollars to finish buying the hay for the rest of the winter and thanks to the overwhelming response we have raised enough to buy all the hay needed for the winter as well as to meet some other needs such as teeth floats and purchase mare... and foal feed and milk pellets to help get some of the foals a little boost. December 30th we will have teeth floats done for 5 of the horses who have shown a definite need and we will be trucking in hay for the next few weeks as well. Thank you Everyone from all the Horses and Volunteers at Rough Start, without the monetary support of the public we would not be able to help such a large number of horses. You make it possible. We are a 501c3 public charity and run on donations from caring people like you who see these majestic animals as kindred spirits who deserve the best we can give them as they have stood by our sides for centuries working the land, fighting wars, taming the west, feeding our children, working our cattle, and just being our partner bringing this world to where we are today. Happy Holidays and a Merry Christmas to all. Rough Start Horse Rescue asks for helpPosted: Oct 12, 2014 7:34 PM PDT &lt;em class="wnDate"&gt;Sunday, October 12, 2014 10:34 PM EDT&lt;/em&gt;Updated: Oct 13, 2014 7:25 AM PDT &lt;em class="wnDate"&gt;Monday, October 13, 2014 10:25 AM EDT&lt;/em&gt;by Victor Correa, KHQ Local News ReporterEmailConnectvictor.correa@khq.com KHQ.com - For Kelly Altiero, owner of "Rough Start Horse Rescue", it was either bite the bullet and take in thirty-four horses from an eviction, with at least nine of them being pregnant, or let them go to slaughter. "We took them in, unfortunately that also doubled our herd size going into the winter," says Altiero. The herd now sits at seventy-one head, far beyond what the shelter is comfortable with, which is usually thirty. Altiero says many of the pregnant mares were bred so that they drop foals at the end of October and November. "Now we're talking winter babies coming in that we're going to need to feed as well," says Altiero. With the big herd only growing bigger the shelter is seeking the help of the community through donations to help raise enough money for at least 60 more tons of hay, which carries a roughly ten thousand dollar price tag. "Right now we're just trying to raise fifty-five hundred dollars, that'll get us at least twenty-five to thirty tons of hay for the time being," says Altiero. The journey started with a phone call asking if we could take 34 horses. Several pregnant mares a bunch of foals, yearlings and a bunch of stud colts. The owners of the herd had turned studs out with a bunch of mares and were now being evicted because the property they had had the horses on sold. The horses owners had known for several month about the need to find a new place to keep the horses but had failed to move them. Unfortunately the owner had also had some bad information/science behind his breeding program. He was under the impression that if you bred a curly stud with any other horse the foal would be a hyper allergenic horse, ( like breeding a poodle to a lab). So for two years he just bred and bred these mares, many honestly to young to have babies. We had been contacted by the property owner and when we showed up that day the owner of the horses had originally refused to let the horses go. He was going to let the horses go to the auction yard, after a while of talking to him he agreed to sign over all the stud colts and pregnant mares and nursing babies. That gave us 25 horses. The other 9 horses went to the Auction Yard. These horses were like trying to load 1200lb puppies that weren't leash trained. The owners who insisted they were trained had not done these horses any favors as the only thing they were trained to do was eat treats from your hand. So what we basically have is a wild herd that is not afraid of people and we quickly found out that they would go through us and over whatever is in their way. It took us 4 days to get these horses loaded and transported to a holding pen at our Ford location. In those 4 days we ended up with bumps, bruises, concussions, and a few broken ribs. Now about 15 days latter we got a call from the auction yard saying they don't have room to hold them any longer and can we take the other 9. We agree as we don't want to see the horses go to slaughter. However these 34 horses now more than double our herd. It takes us to 64 horses with at least 8 more foals to drop between now and February. Rough Start sprung into action on July 9, 2014 when they got the call that there was a forest fire over near Long Lake. They rounded up volunteers and trailers and buckled down for what appeared to be a long night. After talking to Fire Command and getting permission to go in and start helping hauling out peoples horses and other animals, Rough Start volunteers went to work like a well oiled machine. Even the youngest of the volunteers ages 13 and 11 manned the rescue setting up pens and feeding and watering while everyone else hauled the animals in. Everything was going well the animals had all loaded fairly easily, when we got the call that five horses needed to be moved asap. It was 11:30 at night when we arrived to help move the horses, you could see the glow from the fire in the tree line burn brighter as the fire moved closer. The owners were trying to round the horses up as they were not halter broke, one was a pregnant mare. We managed to get three of the horses into panels and were then able to run them into the trailer. Mean while the fire had gotten much closer. We had three loaded and ready to move out but where was the other mare with her baby she had just foaled 24hrs earlier. The owner was still trolling the pasture for her and finally found her. We sent the trailer with the three horses ahead to the rescue figuring we wouldn't be far behind. After a bit of wrestling the owner got a halter on the mare who at this point was scared to death. The fire was getting closer as we could see flame in the tree line. After trying to load the mare and having her bolt several times, one of the volunteers picked up the foal and placed it in the trailer. Up came mom, she sniffed at the trailer, we set one of her feet in as she pulled against the lead rope. The smoke was getting thick and the wind had changed we had to get her in and go. She refused, out of pure fear she was froze almost to the spot. We picked up one hoof, and then quickly picked up the other and as soon as that second front hoof hit the trailer 4 people picked up that mare from underneath her rear end and pushed her into that trailer, we shut the door and got mom and baby to safety. This was just one of the amazing acts performed by Rough Start volunteers during a 48 hour period. They endured blazing heat during the day and pitch black working conditions at night with little to no sleep. As of July 11 a lot of the animals were able to return to their homes and Rough Start was so glad to have been able to take them back to their loving families who had cared enough to remove them from danger. Two mares were dumped in an unfenced field this October, off of Hatch road in Deer Park. They had been left without food or water. Luckily the field gave enough feed for the horses to survive on even though the grasses were dying. Concerned Samaritans trucked water into the field daily so the horses wouldn't die of dehydration. Why were they left there? Why didn't anyone call the authorities? The horses were most likely dumped by people who could no longer afford to feed them but could not bring themselves to have the horses put down or taken to auction. The land that they were dumped on is owned by a company in Idaho so no one but the surrounding neighbors even knew the horses were there. 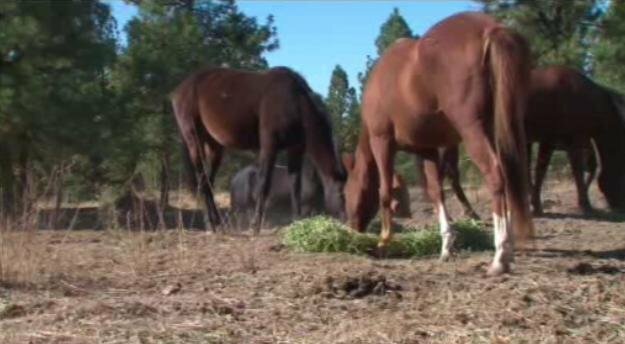 The property was located in Spokane County and the lines between Sheriff jurisdiction and animal control is blurred here when it comes to horses. The Sheriff claims it to be SCRAPS issue and SCRAPS claims it to be the sheriff who needs to deal with it. This seem to be a major problem in Spokane County and definitely an irritant to anyone trying to get help for abused or abandoned horses. It also gives the public mixed messages when SCRAPS takes in a large confiscation of horses and asks the community to help and support these seizures and then tells concerned citizens that they don't deal with horses. What should be explained is that horses as far as Spokane is concerned are livestock, and livestock fall under sheriff jurisdiction. SCRAPS is able to come in and seize horses and other livestock only after enough evidence have been gathered to issue a warrant. Horses are not considered pets, and as livestock the line for what is and what is not abuse is a lot wider. The two mares were definitely in need of some groceries but otherwise seem to be in good condition. They are friendly and like human contact. These girls were very lucky that they were dumped in an area with such caring people who refused to take no as an answer, and insisted on finding away to save these beautiful mares. Only working together as a community are we going to beable to stop animal abuse and cruelty. Mustang Ranch and Rescue ........ Rough Start Rescues 5 of the 9 left. We were featured in an article by the Shoshone Press link below. them. Any donations for these horse will not be turned down as they are going to need a lot of hay, and grain as well as supplements. There is also a good possibility that several of the mares are eating for two so along with gaining weight they will need even that much more. We will need more grass hay as well as alfalfa so they can free feed and increase weight even through winter. Please call or Message us if you are able to donate. an emergency to get thru to the help they need. You all did the job you set out to do which was to make the authorities aware now let them do their job. Without more reliable information and the whole story we are with holding judgment either way and letting the authorities do their job. We however offered our help if needed if or when they have finished their investigation. I will post an update when their is any more credible info to be had. Spokane Fair was a Success!!!! The Spokane fair was a blazing success with 4 horse adopted at the fair an one more adopted from a contact made their. The Pennies for Ponies Cookie sale raised enough money to buy 15 tons of hay... YAY!!! The kids and horses did grest even bringing in a few ribbons. The costume contest was a hoot with Ice dressed up as a poodle and Sunny done up like a tiger. The highlight was the Lone Ranger with Silver. If you didn't see it click the link to see the horses on the news. UPDATE: The two horses went back to their previous owner. Unfortunately the rescue got stuck with the bill or will have to seek it out in court. We were sadly roped in to a domestic dispute with stories and lies flying like snow and the rescue ended up with the short end of the stick. We will see if it will be worth filing in small claims court for the vet care, farrier care and feed the horses received. they could do til Monday. area where horses are concerned as they are still considered livestock not pets. funding the rescues that can. and we will know more as the days go by. Q6 are both continuing to follow this story. in a foster situation until the investigation is finalized. Rough Start Takes in Mountain Ridge Animal Rescues Horses! We are sad to announce that Mountain Ridge Animal Rescue has had to close its doors. We were contacted earlier this month and asked to take in their 6 rescue horses. Due to unforeseen circumstances they had to suddenly shut down we were there to answer their call for help and now have added 6 more horses to the Rough Start herd. A thoroughbred mare who has mastitis and will be heading to the vet to see how best to help her. A little paint mare who will need special farrier attention as it appears she at one time foundered or/and had a bad bout with laminitis. A beautiful saddlebreed who came to them with two abscessed hooves is on the mend and doing well. We welcomed back peaches who was an original rough start rescue adopted by mountain ridges president, and two mares who will be permanent residents here at the rescue as their original owners sponsor the horses care they just are unable to provide it due to health issues. We will have updates on these horses as we get more info and will have pictures posted soon. They will be available for adoption as soon as the vet and farrier are done with their recommendations and we are able to confirm their training. Before taking in Mountain Ridges horses we were already over the number of horses we like to stay within, now we are at 51 head. Needless to say any donations of feed or fencing supplies as well as building supplies would be greatly appreciated and a huge help.